My absolute favorite part of blogging is making new friends-- often from many different parts of the world. 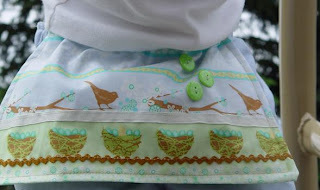 One of my newest bloggy friends is The Sewing Dork. Not only does she have some fabulous ideas, and an amazing stash of fabric, but she is hilarious. There is nothing better than a friend who can make you laugh. She has graciously added a cute tutorial to my Sewing 4 School series. I can't wait to make a pair of these for my girlies! Dress up some courdoroy pants with a little apron. And a fun pocket too. Here's how: Using an existing pair of pants as your template, cut four from fabric. Remember to add room for seam allowances all around, and extra at the top for adding a casing for an elastic waistband. With right sides together, you will have two pairs like this. Sew each inner leg seam. Open up the parts you have just sewn and lay one on top of the other (right sides together). See that big horseshoe at the top? Sew it all up. 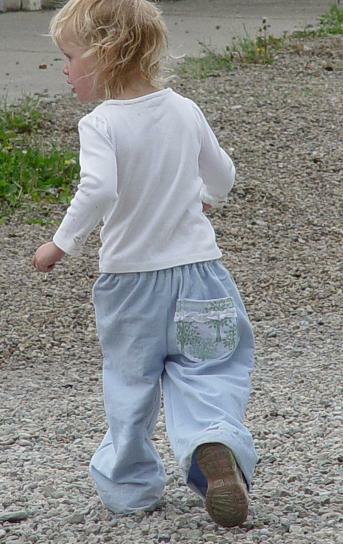 When you turn your pants right side out they will look like... ta da... pants! The pocket is made from two squares of fabric. Fold them in half lengthwise and cut/curve the bottom as shown. Sew right sides together, leaving the top edge open for turning. Before you sew up the outer leg seams, position the pocket where you want it (remember you will be folding down the top for an elastic casing, so set your pocket lower for now) and sew into place. Now stitch the outer leg seams closed. On to the fun apron! Cut out two identical pieces - one front and one back. How big? Not quite as wide as the finished pants and about long enough to hang to the crotch seam on the finished pants. Embellish the FRONT of your apron with ribbons, buttons and trims as desired. With wrong sides together, sew the apron front to the apron back leaving the top open for turning. Turn right side out, fold in the top neatly and topstitch all around. Back at the pants, finish the top edge (either zigzag or serge) and fold down to make a casing for an elastic to thread through. Do not put the elastic in yet. First, position the apron to line up the top with the top of the pants. Carefully stitch just around the top, very close to the top edge. This will hold the apron in place and will also give you a nice look to your elastic waistband. See where the elastic is going to sit? You can thread it through now. This the look of the finished waistband. Hem the pants. Test drive them. A nice little twist on back-to-school clothes. These are great! I can see myself making a few for Wednesday for the fall. Oh my God, this is so cute!! Love these! Thanks for the tute. How fun! Thanks for the tutorial! i LOVE this! my girls HATE pants... simply not girly enough as far as the're concerned... but these they would totally rock! thanks for the tute! Awesome! So simple anyone can do it! !